Mr. Allen Gina is the Co-Founder of CT Strategies which provides strategic services to clients seeking current and innovative insight into border management and supply chain challenges in the U.S. and around the world. Prior to establishing CT Strategies, Mr. Gina served as Assistant Commissioner for International Trade at U.S. Customs and Border Protection (CBP). As Assistant Commissioner, Mr. Gina oversaw a workforce of over 1,000 employees and a budget of over $300 million, and was responsible for leading the most extensive trade transformation initiative in CBP’s history. 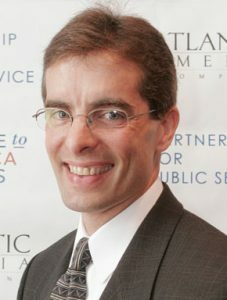 Prior to serving as Assistant Commissioner for International Trade, Mr. Gina served as the Assistant Commissioner for International Affairs; (A) Assistant and Deputy Assistant Commissioner for Intelligence and Operations Coordination, and (A) Executive Director for the Joint Operations Directorate at CBP. Mr. Gina was appointed to the Senior Executive Service in 2004 as the Executive Director of the Container Security and Secure Freight Initiatives. Prior to entering the Senior Executive Service, Mr. Gina served as Customs Inspector, Supervisory Customs Inspector, Chief Customs Inspector, and Area Port Director, as well as the Director of various offices including: the Customs Industry Partnership Program, the Customs Outbound Program, and the Customs Office of Border Security. Throughout his 30 plus-year career at CBP and its predecessor agency, the U.S. Customs Service, Mr. Gina has been a pioneer and a leader, developing broad and far-reaching national and international programs to support anti-terrorism and trade transformation policies. Prior to and during the first year of operation of the Department of Homeland Security (DHS), Mr. Gina was assigned to the Border and Transportation Security Directorate as Director of Agency Coordination to help establish policies and procedures. Mr. Gina is a native of New York City and received a Bachelor of Arts degree from Queens College and is a graduate of the Office of Personnel Management’s Executive Development Program and the Harvard Kennedy School of Government Senior Executive Fellows Program. Mr. Gina has received numerous commendations and awards and has been conferred the rank of Meritorious Executive by the President of the United States. Mr. Gina lives in Virginia with his wife and has a daughter that lives in the District of Columbia.